Sun exposure is responsible for most of the visible aging of your skin—far more than all other factors combined. Yes, UV rays from the sun are the primary cause of wrinkles, pigmentation, sun spots, reduced skin elasticity, the degradation of skin texture, and many other signs of skin aging. In fact, many scientific estimates have shown that up to 80-90% of how young or old you look for your age is due to how much sun exposure you’ve sustained. This has been shown repeatedly, in different parts of the world, over many years and in many different clinical studies. Maybe these tidbits of information from formal studies will make you more aware of exposure to the sun. As it turns out, skin changes brought on by age are readily distinguishable from skin damage caused by sunlight. Sun exposure damages five major parts of the skin. This damage can cumulatively be termed dermatoheliosis, and it involves the epidermis (actinic keratosis), dermis (solar elastosis), blood vessels (telangiectasia), sebaceous glands (solar comedones), and melanocytes (diffuse or mottled brown patches). The consequences of sun exposure are both cosmetic and medical. And if this next study doesn’t convince you to wear sunscreen….. In this study, two populations of people—one from a high sun exposure environment, and one from a low sun exposure environment—were examined. The two groups were examined for hyper-pigmentation and wrinkling using high-resolution digital video imaging. As expected, the people from the environment with high sun exposure had darker skin, higher facial hyperpigmentation, and more facial wrinkles. Most significantly, the number of wrinkles was highly correlated with the total hours of life spent outside. Non-melanoma skin cancer was also highly strongly related to higher levels of UV exposure. Just like in the previous study, these authors summarize that the number of wrinkles a person has may be a good indicator of total sun exposure in life. 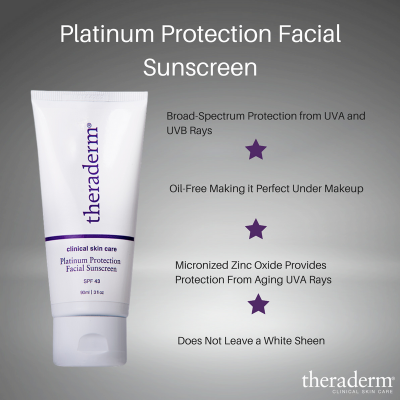 We recommend Theraderm Platinum Protection Facial Sunscreen with SPF 43+ and broad-spectrum protection from both aging UVA rays and burning UVB rays.